Buying herbs at the grocery store is a sign of defeat. Not defeat, even, because defeat would suggest that you tried and failed. It's more like inertia. Because really, if you can't grow a few herbs, you have just given up on having any kind of interaction with the plant kingdom or the parcel of soil around your home. This is the year to change that, and the reason to make that change is because there are so many very nice cocktails that just require a pinch of some herb or another. A cocktail should be an impulsive decision, one that doesn't require a trip to the grocery store. If you think about it too long, you might just talk yourself out of it, in the name of clean living or moral reformation. Better to have all the ingredients on hand before you are seized by a fit of reformation. You can cook with these, too, of course. But this is my list of the most useful drinking herbs, all of which can be started this month if you give them a little protection from the cold. Spearmint. Indispensable in mojitos and juleps, and generally useful in any drink that combines fruit and alcohol. Mint adds a little botanical complexity to what can otherwise taste like a juice box for adults. Look for spearmint, not peppermint or any other kind of mint. Grab "Kentucky Colonel" if you can; it produces large, fragrant leaves and isn't quite as invasive as other mints. Keep it in a pot against the house where it gets some protection from frost and you'll probably have mint all year long. "Mojito" is another good variety to try. To keep it from spreading, grow it in a pot (you can bury the pot in the ground, leaving 2-3 inches of the rim aboveground, if you prefer), or plant it in one of those small areas hemmed in by concrete on all sides that everybody seems to have around their house somewhere. Give it regular water, and cut off an entire stalk, not individual leaves, when you're ready to use it. If, after a few years, the mint starts to seem tough and bitter, dump the whole thing out of the pot, extract a few young side shoots, and re-pot just those shoots. The new plant will be sweet and tender again. Lemon verbena. Not lemon balm or lemon mint. Lemon verbena. This is a little woody shrub that only barely tolerates our chilly maritime winter, but if you can nurse it through one winter, you're set. I love lemon verbena because it adds a bright citrus sparkle to drinks without making it overly acidic the way lemon juice does. You're looking for Aloysia citrodora, and you can probably find a small one in a four-inch pot at the garden center or farmer's market. If you live inland and get warm summers, it'll reach 6-8 feet after a couple of years. Give it some room or be prepared to cut it back every winter. It will also do fine in a large pot, and won't object to whatever amount of clipping you impose upon it. Just be sure it gets plenty of sun, and be prepared to wrap it in a frost cloth, or even a sheet, in advance of a hard freeze its first winter. If it's in a pot, just move it to a sheltered spot that doesn't get hit by frost. Muddle (crush) lemon verbena into any citrus-based cocktail, or cook up a simple syrup with the leaves (equal parts sugar and water, heated to a boil so the sugar melts and allowed to cool). It works as a garnish too, of course: the clever bartender trick would be to wipe the rim of the glass with a leaf, and then drop a fresh, pretty leaf into the glass. Basil. This is where it starts to get tricky. I confess that I have never mastered the art of keeping a year-round supply of basil going in my garden. I have, however, been successful with a number of strategies that, if implemented together, might just work. So give this a try. First, think of basil plants as a kind of long-lasting grocery store item rather than something you buy from the garden center once a year. In other words, plan on picking up basil plants whenever you see them throughout the year to replace the one that might be on its way out. Second, choose the right variety. The giant, fragrant "Genovese" is wonderful, but it won't last as long. "Greek Columnar" produces smaller leaves, but behaves more like a perennial and might even make it through the winter indoors. Garden centers will probably start selling the new "Bonsai" grafted basil this year, which, as the name suggests, is grafted onto sturdier rootstock and trained into a bonsai shape. Third, try to find a place to grow basil indoors. A sunny, south-facing window is ideal. If you're really committed to this, you'll get a little heated seed mat (available at garden centers and hydro shops for about 20 bucks) and put that under your plant. You can also pull a potted basil from its pot, rinse the roots off, and stick it in a glass of water. It won't live forever, but keep a few going and you'll be surprised at how well they do. 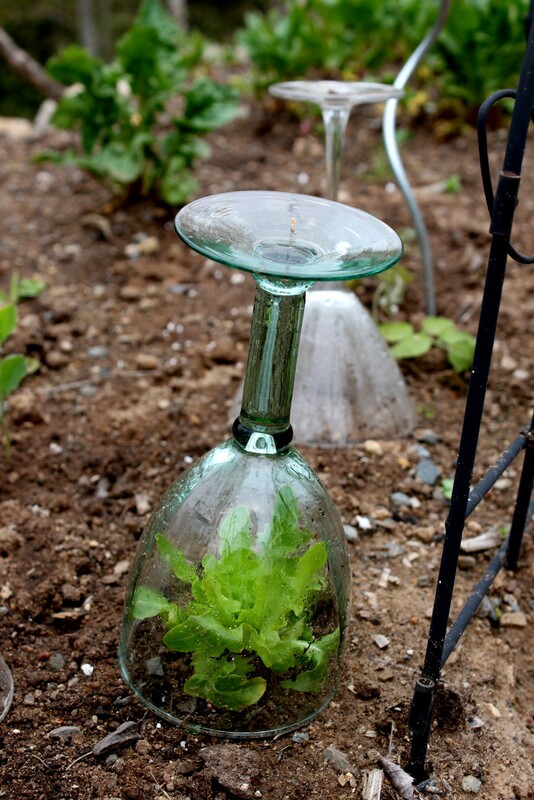 And finally, if you're dying to plant some basil outside but it's not quite warm enough, try this trick, which I learned from Niki Jabbour's new book The Year-Round Vegetable Gardener: Put an upturned wine glass or punchbowl over the plant, cloche-style. It's a cocktail-ish way to grow cocktail herbs. Cilantro. Everything that applies to basil also applies to cilantro. For both plants, cut back an entire stalk to harvest it, rather than snipping off individual leaves, and pinch off the flowers. Everything else. There are no instructions for these, because all you have to do is stick them in the ground in a sunny spot and stand back: rosemary, thyme, sage, scented geranium. Here's a drink using the only herb you might actually have growing in your garden right this minute: rosemary.